When you’re going into a space for the purpose of decluttering, there is a system that makes it easier. You’ll need the following bins, boxes, baskets, or bags. Box #1 – The Donate Box: This box, bin, basket, or bag is for all of the items that you will be donating or selling. These items are in good, usable condition, they just need a new home. Box #2 – The Relocate Box: This box, bin or basket is for all the items that you are keeping, they just don’t belong in the space you are decluttering. Bag(s) – The Garbage/Recycling Bag: Recycle what you can, but trash the garbage. Your home is not a landfill. After you’ve decluttered, it will be easier to avoid bringing things into the house that quickly become garbage. For now, give yourself a clean slate. You need space to declutter. Clear a surface to declutter on, like a floor, desk, or table top by moving everything on that surface to a place you’ve not decluttered yet. You’ll notice in the assignments for the different rooms, we often begin in the closet and inside of drawers. This is probably opposite of how you’ve been taught to clean up, but this approach will give you the space to put back things you are keeping while you are decluttering other places. Once the insides are clean, the whole room feels do-able. And I mean everything. While you pull each item out, make quick decisions and place the item in one of the containers from Step #1. For the things that will go back where you found them, place those items on the clear surface you created in Step #2. In these 91 Days, I’ve broken rooms up into smaller areas to focus on each day. While you’re decluttering that smaller area, you can break it up into even smaller sections – whatever makes sense to you. Many people find it less overwhelming to declutter one cabinet, one drawer, one shelf at a time. Go over the items AGAIN that you decided to keep and placed on the clear surface while you put them back where they belong. Be ruthless. If you find yourself pondering an item, chances are you should declutter it but the longer you hold it you’ll be more likely to talk yourself into keeping it instead. Repeat Steps #4-5 until the entire area is decluttered. Immediately remove the trash and recycling before it becomes part of the scenery or things find their way back out! Put the donate items into the back of your vehicle to take to your donate center as soon as possible. 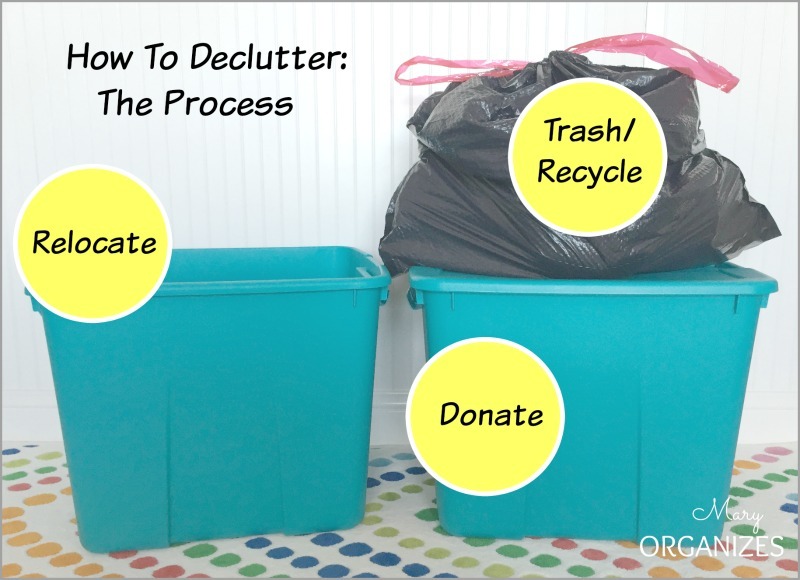 Remove donate items from the home so that (1) you can begin enjoying your decluttered area right away and (2) you’re not tempted to keep any junk. For sale items: Give yourself a deadline to sell, then donate after that date. Use a flat surface like the floor or table, then sort the Relocate Box into groups of where things go (i.e. kitchen pile, kids room pile, etc.). Put these items where they belong! If they don’t have a place to be, they don’t belong in your home!! My pile at the end of decluttering my girls’ clubhouse room. Yes, this is a lot of work! And this is why we break up decluttering different sections of the room on different days during the Declutter Challenge. A little work every day adds up quickly by the end of the week! LOVE your thought about not letting our homes become like a landfill! Another similar thought that really helped me was a thread in your FB group a long time ago discussing hoarding and a few expressed that, “at least I’m not a hoarder because at least I don’t keep garbage.” But I’ve noticed that much of what I keep, my husband would have been quick to trash. I guess one person’s treasure (or items to save/fix/gift/repurpose) is another person’s trash. Helps me be a little more critical with what I keep. That is a very powerful realization, Elaine. Thank you for sharing!! Oh no! Work on that right now! Is it bad to do a garage sale pile which is stored to be sold later or is it just better to get rid of it and donate? In my experience garage sale piles do not work unless you are super-vigilent and already have a garage sale plan in place. You know yourself, will you REALLY have that garage sale, or is it an excuse to keep the stuff around longer. And if you do decide to garage sale it, give yourself a hard deadline! It sounds really interesting but for me, the site didn’t clarify what they are doing. Sign up, pack up and send. So does Yerdle just post your picture on their site and then if it sells they send you a check? I’m a little anxious about starting this decluttering process I know it sounds stupid. I hired a professional organizer two years ago. I don’t even want to add up how much I paid her and the results were my house looked worse than before I hired her. My husband had passed away unexpectedly I was in so much grief and shock most of what we did was talk. When I realized I was paying her to be a friend I stopped. It wasn’t her fault I just wasn’t ready. Michelle, your comments have so encouraged me…I, too lost my husband, in 2013. My house just keeps getting worse and worse. I stopped cleaning early on when my 20 year old daughter saw that I had moved things in our closet ( just shuffled to give me more space for my clothes), and she was devastated! I think I am ready to really begin, and after seeing your post I am truly thinking “yes!”. You don’t know me but let me say thank you for your thoughts! Hi, Michele – I lost my husband Jan 15, 2015, so my heart goes out to you. I still have his clothes & most of his books in bags all over the floor & sofa in my sitting room! (a little room right outside my master bedroom). My step-daughter kept saying she was going to get them, but every time she would something would happen (not her fault, the truck would break down, Hal would have an accident at work…. ), but I told her if she couldn’t get them by the first of the year, I would have to do something with them. I know a charity in our area that all year long collect things for a big yard sale they have once a year. Then they take that money & buy little kids toys for Christmas who wouldn’t otherwise get any toys or gifts. They will even come pick it up; you don’t have to bother to take it to them! Which is GREAT!! You hang in there! You CAN DO IT!! My brother-in-law, Gary, told me this when Rick had first died and I was overwhelmed with taking care of insurance and finances, taxes, etc. He said: How do you eat an elephant? One bite at a time! I wish you the best. If you want to be friends on FB, I’m Beth Davis in Florence, AL. I think Mary’s site is going to help us all! I am sorry for everyone’s loss. May I ask a question? My dad passed away last week. My mom is now alone. I know it’s not time yet to go through my dad’s things. Insurances, finances, … is important now. You all said you were overwhelmed, you didn’t go through the stuff. From today’s perspective would you have liked someone to say something/ motivate you? At which point? I am sure my mom will be like this. I want to know how I can help her best in this time. How to know if she is ready? It will be a lot of work. I’m so sorry for your loss. I lost my mom unexpectedly in 1987 and my dad last March. It’s not easy under any circumstances. From my experience, I would say that you should talk to your mom and let her know that you will be there to help her when she is ready. I think that will give her the reassurance that she’s not alone without feeling rushed or pressured. Everyone deals with grief differently and on their own timetable. I would also suggest that you be prepared for silly things to set off tears. I was cleaning out a kitchen cupboard and went “into the ugly cry” when I ran across my dad’s favorite seasoned bread crumbs. There is simply no explanation. To Michelle and the other ladies who have lost their loves, i am so sorry to hear of your losses. I was talking to a friend only yesterday who replaced a light fitting that her late husband made with a new one. She said it was time now (after 25 years) to remove the last trace of him. Her house is now finally her house (and he never even lived in this one .. she bought it after he passed) so it is obviously a very difficult process to declutter a lost loved ones’ things especially when your situations are much fresher. As to how to decide, Marie Kondo (konmari method) has a great philosophy that really resonated with me: Does it spark joy? She suggests holding each item in your hands and getting a feeling from it. Does it bring you joy? If so, find it a home, if not, out if goes. She also suggests tackling personal items like photos and letters LAST because they are the most difficult. 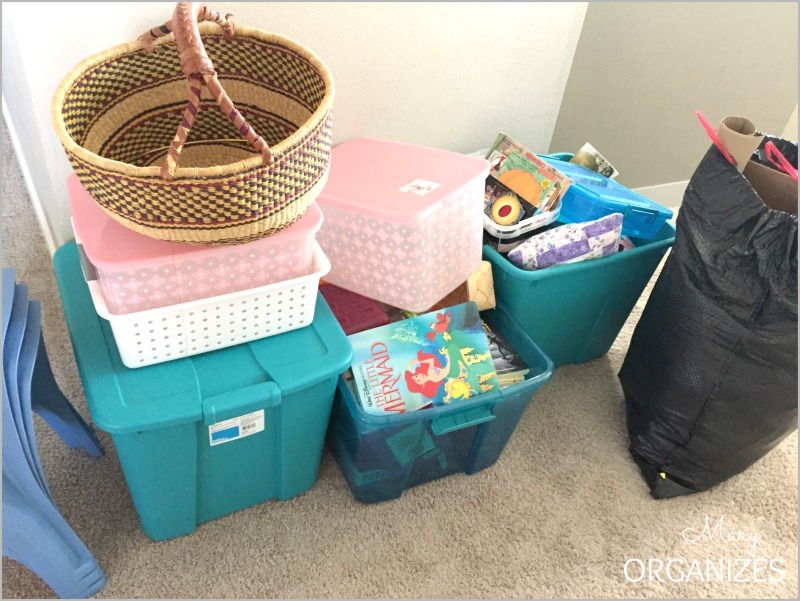 I would put all those items into storage bin/s until the end of the decluttering challenge (or even longer until you are ready emotionally) and start with easier items. While I don’t follow the KonMari process 100% I find her simple decision making process works for me. Her book is The Magic of Tidying Up and is well worth a read. My mom, who is now an angel in heaven, always used the Kon Marie process when I was a child. I thought it was her special way of getting me to clean/organize. Whenever she got tired of all us kids (4) asking “where is my ________,” she’d put a blanket in the middle of the floor, dump everything from our closet into the floor and tell me to put the back into the closet so we could find it. I was between 5-7 at the time and all of us kids shared that one closet. When I wed at 18, everything I owned fit into one large suitcase with the exception of my winter coat. She taught me to enjoy the people in my life not things and to share my blessings with others. The Kon Marie process has been around long before Kon Marie, as it was intuitive to your mom too. There is a lot of good in her method that is actually similar to the good in a lot of other organizers methods … that they were doing before it was given the name of the Kon Marie method. 🙂 Removing everything from an area before decluttering and organizing it is a tried and true method for sure. I’ve certainly been doing it and recommending it for years before her book became popular. I love the idea of taking one room or one closet at a time. It’s not so overwhelming. Exactly! Whenever we try to focus on the whole big problem at once it seems daunting. Breaking it up is a must for the long haul. After my husband died, when I moved into my current (smaller) house, there was a lot of stuff I just couldn’t deal with, so I put it into boxes and then into my new garage to deal with later. Well, it’s later now — years later! I am so ready to declutter. My project will be complicated by the fact that my adult son, who has Aspergers and OCD-like symptoms, freaks out whenever anything is moved from its accustomed place. But I feel really motivated and ready to tackle this. Maybe consult a therapist about ways to make it easier for him. I have a few thoughts, but you may want to run them by a professional therapist first. My thought is to clearly communicate in advance what is going to happen and give him time to process that change is going to come and then reassure him that it will make things better (fill in the blank for things that will affect him specifically). Good luck! I use to be so organize and would hardly keep anything. Then I married a man that is a pack rat/fixer upper and he will not hardly let me throw anything away. Now I seem to have taken on his packrat syndrome. Is there hope for me ??? Love this! I am going to try this! Sounds good. Having a plan of attack can make a huge difference. I ‘inherited’ a ton of ancient family photos going back to late 1800’s. Not every photo can be identified but I’m having a hard time throwing away vintage photos, no matter who is in it. Then, what about the many plastic crates I have of family that we can identify?? My extended family is not interested in these pics. I would say I have about 15 plastic crates or boxes of every possible size…what do I do with them? Hmm – could you try contacting the local historical or genealogy society. Maybe someone like that cantake them off your hands. In the least, you can send them to places where they can convert the images to digital format. This would take up much less room. Where did you read that there was a free printable goal sheet? This exactly what I do! Thanks for the validation! I bought the bundle decluttering last year. I did not downloaded, or print it. How do I get access to it? I am ready to start the challenge this year! I’m happy to help you with this. I can’t go over all the details in the comments, but message me (https://creatingmaryshome.com/contact/) and I will help you!